Both in times of trouble and in moments of ecstasy, critical junctures when strength and heightened stature must prevail, the Tehillim has always been the companion and good friend of the Jew. Accompanied by the Sweet Singer of Israel, with his symphony of solace, and harmonious life-view, one can discover a piece of his own heart in the outpourings of King David, the collective heart of Israel. Rabbi Avrohom Chaim Feuer, acclaimed author of the ArtScroll Tehillim, A Letter for the Ages and Shemoneh Esrei, captures the pulsating joy, invigorating energy and comforting companionship that Tehillim can provide for us all. There are Psalms for Parenting, Positive Thinking and Parnassah. Tehillim will help you grow in your personal relationships, find peace of mind under adversity and open your heart so you can pray like you've never before. 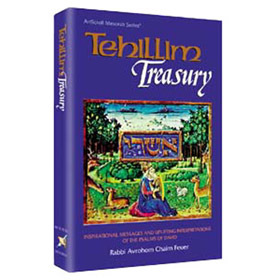 Tehillim Treasury is a veritable storehouse of valuable insights. Within it you will discover the key to unlock the greatest treasure of all - yourself.